Raith Rovers winger Nathan Flanagan is hoping to take a leaf out of James Forrest’s book after following up his Scotland hat-trick with a goal of his own at Hampden. Flanagan watched the Celtic winger destroy Israel last midweek before putting in his own impressive display at the national stadium in a 3-0 win over Queen’s Park in the Scottish Cup on Saturday. The levels may be completely different, but Flanagan believes he can learn from Forrest and other top international wingers such as Raheem Sterling as he looks to add more goals to his game. His strike on Saturday was his third in 16 appearances for Raith, following a double in a 5-1 away win at Dumbarton earlier in the campaign. “Thank God – I’ve been waiting on it!” said the 21-year-old. “I’m getting a decent amount of assists but goals is something I need to add to my game. “I need to start getting into areas where I can score, and commit to getting to the back post, instead of thinking, what if it doesn’t get to you. “You just need to gamble and get in there. If you look at top wingers such as Sterling, and the amount of tap-ins they get at the back post, I want to add that to my game. “Watching Forrest for Scotland last week is something you need to aspire to. “He’s came all the way through and people said goals were missing from his game. 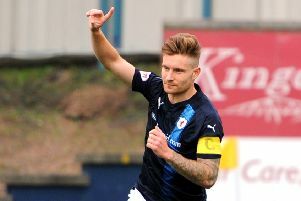 Flanagan arrived at Raith in the summer following his release from St Mirren, where he was unable to make the first team breakthrough. He had loan spells at East Fife, Annan and Elgin City, but he now feels that he is progressing as a player at a parent club that considers him a first team regular. “I’ve been developing here straight from the start of season,” he said. Flanagan has also had some of the weight taken off his shoulders by the arrival of Daniel Armstrong, which means he is no longer the only natural winger at the club. “It’s given us a lot more different variety,” Flanagan said. “Dan has shown his quality in the games he’s played, which gives everybody in the team a different dimension. “It’s not all down one side now as we’ve got two natural wingers who can take people on. It’s a lot better. With his contract due to expire in January, Flanagan is only concentrating on short-term goals, but at 21, he has time on his side as he looks to realise his ambitions in the game. “If I keep playing every week, and just keep building and developing my game, then hopefully I can play as high as I can,” he added.